As we round the final turn and enter the homestretch of construction on the new Community Memorial Hospital in Ventura, more technology is being installed, more cosmetic work is underway, and more areas of the incredible new facility are nearing completion. The excitement amongst our physicians, staff, donors, and community members is growing, and today, we are proud to invite you in for a sneak peek of our new 6th floor! Our 5th and 6th floors are identical patient floors, full of natural healing light and breathtaking views of Ventura’s treasured hillsides and expansive beaches. The exposed diagonal piping houses seismic structural components and was intentionally left uncovered to allow the organic light to pour in. Combined, the 5th and 6th floors have 120 large and entirely private rooms, complete with their own bathrooms and showers. 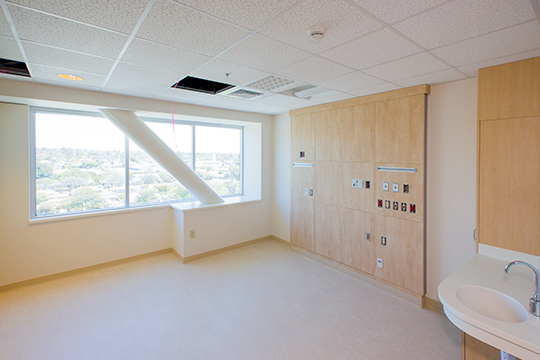 These expanded rooms will enhance privacy and comfort, facilitate more peaceful recovery, and allow for more intimate visits with physicians, nurses, family, and friends. Both floors are made up of an east wing and a west wing – mirror images of each other separated by three visitor-only elevators. 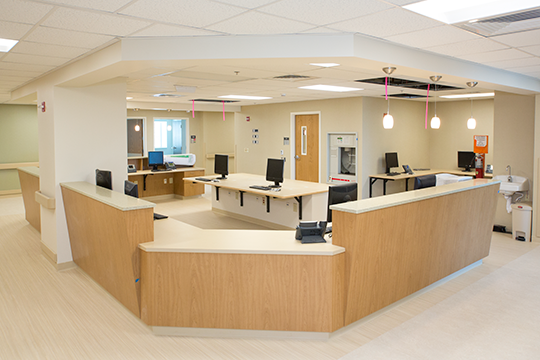 Located in the middle of each wing are large central nurses stations, specifically designed to be accessible to guests while also meeting the dynamic needs of our staff and physicians. Eco-friendly finishes such as recycled glass counter tops and flooring made of organic materials are also found throughout the 5th and 6th floors. If you’d like to see it in person, please join us on an upcoming construction tour. Reserve your spot by contacting Tinette Hood (thood@cmhshealth.org) or Lindsey Dunn (ldunn@cmhshealth.org).